Sound good? 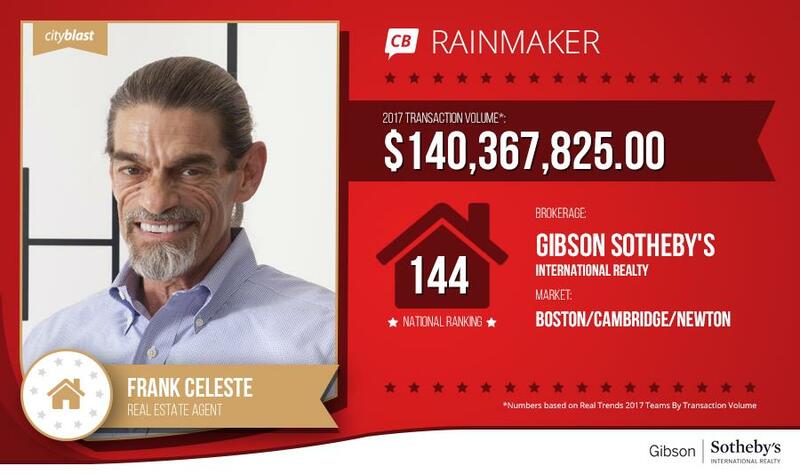 Without further delay, here’s one of the top 1,000 ranked Realtor® in the nation, Frank Celeste of Boston’s Gibson Sotheby’s International Realty, with his top real estate marketing tips and tricks! I have been in RE for over 30 years at this time. I am in all the top Boston markets(Charlestown, South Boston, South End, Back Bay, East Boston, Beacon Hill & Dorchester) and also greater Boston markets. I specialize in residential sales, multi-family & development sites and do some commercial sales. I am also heavily involved with a number of the top custom residential developers in the City selling them multifamily properties to convert into condominiums and also selling them ground-up development opportunities. I have had my real estate license since 1978. My Dad told me to get it, just to always have something to fall all back on, just in case! Funny how things work out. I used it once in the 1980’s to help a friend buy a building and the rest is history. I was in the corporate accounting field climbing up the ladder pretty fast but really could not do the corporate lifestyle or corporate politics. People! I love the people you meet! I also love looking at real estate! I have been truly fortunate to have some of the most endearing long-term client relationships(20-30yrs+). I also enjoy the excitement of helping wonderful people with a transaction that will usually involve the most money they will ever spend or receive! Trying to manage my time- My first year in the business I did almost 100 combined transactions on my own, no assistant. I was also much younger so didn’t get that this amount is not normal to start! It plays a high level for marketing & instantaneous communications with clients! I have a rock solid, very loyal people on my team that support me 24/7! They keep all of my technologies, websites, Instagrams, etc at the most cutting-edge possible level! It ensures that we have maximum exposure for the marketing of my listings! It also keeps all of my communications with clients up to the minute on new listings and feedback on the showings of their homes! My top tool is my cell phone with a big period. If I told you it would not be a secret. I believe if you prove to your clients right from the start that the most important thing in your relationship is whatever is ultimately best for them and that it the only goal you are working towards, the relationship will last forever. I think that # 9 is the reason! Some brokers weigh in too much about what they think a client should do or not do based on their own mindset and opinion. If you do a great job, the money and the referrals will always follow. It’s about the client at every level! I think its been good & bad- Good for prospective consumers as they can get immediate gratification when performing property searches, but it also blends information about properties for values that are often not accurate since the computer or website has never been in the physical property- People buy with their eyes and the feeling they get in a space, its floor plan, finishes and its sunlight orientation & exterior surroundings! Devices will never replace brokers for marketing & selling or accurately evaluating a property’s true worth! There is also a lot less personal interaction which I don’t think is great on any level! I try to get as much third party exposure as possible in a variety of local, regional and well respected real estate publications & the top RE search engines on the actual launch date- The higher the exposure, the more buyers come forward and the stronger the price! I have always remained on a very friendly & professional level with all the brokers I know. I do not see it as a competition between brokers. I hope every broker is professional and excels in this business. Our overall reputation as strong, respectful and honest is great for every broker. You are only as strong as the weakest link, but the weakest link is what people judge the overall industry by- There are many wonderful agents in the markets I work in and I have always enjoyed doing business with all of them. Educate & Listen. The first time buyer price range is a strong number and if I were going to buy my first home at that pricing level I would want to know everything possible about values and get everything I desired in that home! I think that real estate buying & selling process should be a pleasant, smooth, warm(fun) and exciting process. I pride myself that mine are often described that way! I truly love what I do and feel grateful every day that I can do this job! I don’t have an endgame – Every day brings something new, interesting & exciting! RE is one of the few fields that you never know what will happen tomorrow. I thoroughly enjoy interacting with my clients, meeting future clients and solving any challenges that come my way! I make my own schedule and feel no pressure to move onto anything else! I have been extremely fortunate that I have been able to support many worthwhile charitable causes because of my work in RE. I truly believe the other part of what I love doing is interacting, mentoring and advising my great young and extremely knowledgeable team! They excel to get better and stronger and do more for our clients 7 days a week! They are the best of the best and I am truly blessed to have them by my side! I could not ask for a more loyal or hardworking group of men & women! They add excitement to my day, every day!